The Kingdom of Belgium is a country in north-west Europe, considered along with the Netherlands to be one of the Low Countries, and a founding member of the North Atlantic Treaty Organization (NATO), whose headquarters is in the capital of Brussels. Belgium is located in Western Europe, bordered by the Netherlands, Germany, Luxembourg, France, and the North Sea. Although generally flat, the terrain becomes increasingly hilly and forested in the southeast (Ardennes) region. Climate is cool, temperate, and rainy; summer temperatures average 77 °F, winters average 45 °F. Annual extremes (rarely attained) are 10 °F and 100 °F. Geographically and culturally, Belgium is at a crossroads of Europe, and during the past 2,000 years has witnessed a constant ebb and flow of different races and cultures. Consequently, Belgium is one of Europe's true melting pots with Celtic, Roman, Germanic, French, Dutch, Spanish, and Austrian cultures having made an imprint. 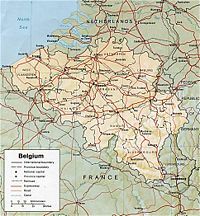 The country has since 1977 been divided into three semi-autonomous regions: Flanders (the Dutch speaking area), Wallonia (the French speaking area, with a small German-speaking minority) and the Brussels capital region, a bilingual 'island' within Flanders. Belgium is divided ethnically into the Dutch-speaking Flemings and French-speaking Walloons, the 70,000 residents of the eastern German cantons, and the bilingual capital of Brussels. The population density is the second highest in Europe, after the Netherlands. Annual population growth rate (2008 est. ): 0.82%. Density: 861 per sq. mi. Linguistic regions--(Dutch-speaking) Flanders 58%; (French-speaking) Wallonia 31.7%; (legally bilingual) Brussels Capital Region 9.6%; German-speaking 0.7%. Religions: Predominantly Roman Catholic (70%), with Protestant, Jewish, Muslim, Anglican, Greek and Russian Orthodox, as well as secularism, "recognized" religions receiving government subsidies. Ethnic groups: Flemmings 58%, Walloons 33%, Africans and Asians 4%, Other Europeans 5%. Belgium is a hereditary constitutional monarchy. The current monarch is King Philippe, who took the oath of office on July 21, 2013. The allocation of powers between the Parliament and the Council of Ministers is somewhat similar to the United States—the Parliament enacts legislation and appropriates funds—but the Belgian Parliament does not have the same degree of independent power that the U.S. Congress has. Members of political parties represented in the government are expected to support all bills presented by the Cabinet. The House of Representatives is the "political" body that votes on motions of confidence and budgets. The Senate deals with long-term issues and votes on an equal footing with the Chamber on a limited range of matters, including constitutional reform bills and international treaties. The largest parties in the current Chamber are the Flemish Liberal Party (VLD), 25 seats; the Francophone Socialists (PS), 25 seats, the Francophone Liberals (MR), 25 seats; the Flemish Socialists and Spirit alliance (SP.A/Spirit), 23 seats, the Flemish Christian Democratic party (CD&V), 21 seats; the right-wing Vlaams Belang party (VB), 18 seats; and the Francophone Christian Democrats (CDH) 7 seats. The Francophone Greens (ECOLO), have 4 seats, while the New Flemish Alliance (NV.A) and Francophone Front National each have 1 seat. The Flemish Greens (AGALEV—now Groen!) did not win any Chamber seats in the 2003 election, but have one "co-opted" Senator (see below) as a result of an agreement with the Flemish Socialist Party. National elections have taken place on June 10, 2007, the major winner being CD&V. A lengthy period of time went into forming a new government, marked by a period of informal talks (led by Herman Van Rompuy) and formal talks (led by Yves Leterme), both being appointed to do so by the King. Yves Leterme succeeded in forming a government and getting the support of parliamend needed to govern. In December 2008 however, the government fell over a scandal involving the separation of powers, with Yves Leterme and Jo Vandeurzen (then minister of Justice) being accused of trying to influence the course of justice. The King appointed ex-prime minister Wilfried Martens to informal talks, which eventually led to Herman Van Rompuy being named new Prime Minister. Much of Yves Leterme's government was held in place, with only a few spots replaced. As of January 2009, this government led by Herman Van Rompuy was expected to carry its full term until the next election in 2011. However, when Herman Van Rompuy was chosen to be the first President of the European Council, he had to abandon his job as Prime Minister, in order to avoid conflicts of interests. As such, Yves Leterme was named Prime Minister again. No other major changes were made to the Belgian government. At the federal level, executive power is wielded by the Council of Ministers. The Prime Minister chairs the Council. Each minister heads a governmental department. No single party or party "family" across linguistic lines holds an absolute majority of seats in Parliament. Consequently, the Council of Ministers reflects the weight of political parties that constitute the governing coalition for the House, currently the four-party Liberal-Socialist coalition. The Concert of Nations sanctioned the creation of Belgium in 1830 on the condition that the country remains strictly neutral. During the two World Wars Belgium tried but was unable to follow a policy of neutrality due to the German invasions. In 1948, Belgium signed the Treaty of Brussels with Great Britain, France, the Netherlands, and Luxembourg, and a year later became one of the founding members of NATO. Belgium remains a strong proponent of both NATO and European defense efforts. Belgium also is a strong advocate of strengthening economic and political integration within the EU. Having federalized their own country, many Belgians view themselves as the ultimate "European federalists." Both NATO (since 1966) and the EU have their headquarters in Brussels; SHAPE (Supreme Headquarters Allied Powers Europe, NATO's military headquarters) is in the south of the country, near Mons. Belgium supported the expansion of NATO and EU membership to the new democracies of central and eastern Europe and is actively engaged in the Organization for Security and Cooperation (OSCE) in Europe. Belgium served as the Chair-in-Office of the OSCE in 2006. Belgium sits on the United Nations Security Council during 2007-2008. The number of seats in the House of Representatives is constitutionally set at 150, elected from 11 electoral districts. Each district is given a number of seats proportional to its total population (not number of eligible voters) ranging from 4 for the Luxembourg district to 24 for Antwerp. The districts are divided along linguistic lines: 5 Flemish, 5 Francophone (also called Walloon or Wallonia), and the bilingual district of Brussels. The Senate consists of 71 seats. For electoral purposes, Senators are divided into three categories: 40 directly elected; 21 elected by the community parliaments; and 10 "co-opted" Senators. For the election of the 25 Flemish and 15 Francophone directly elected Senators, the country is divided into three electoral districts: Flanders, Wallonia, and the Brussels Capital Region. Of the 21 Senators representing the communities, 10 are elected by the Flemish Parliament, 10 by the French Community Parliament, and 1 by the German-language Parliament. The remaining category, the 10 "co-opted" senators, are elected by the first two groups of senators. The princes and princesses of the royal line are also members of the Senate—currently Prince Phillippe, Prince Laurent, and Princess Astrid. Several months before an election, the parties form a list of candidates for each district. Parties are allowed to place as many candidates on their "list" as there are seats available. The formation of the list is an internal process that varies with each party. The number of seats each party receives and where on a list a candidate is placed, or how many individual votes a candidate receives, determines whether a candidate is elected. Since no single party holds an absolute majority in Parliament, after each election the strongest party or "party family" will create a coalition with other parties to form the government. Voting is compulsory in Belgium; more than 90% of eligible voters participate. Voters have five options when voting: 1) vote for a party list as a whole (thus agreeing with the party's ranking of candidates), 2) vote for one or more candidates regardless of list ranking, 3) vote for one or more "alternates" (substitute candidates), 4) vote for one or more candidates AND one or more alternates, or 5) vote invalid or blank so that no party or candidate is chosen. In August 1980, the Belgian Parliament passed a devolution bill and amended the Constitution, establishing "Community autonomy." As a result, in Flanders, the Flemish Parliament and government are competent for both regional and community affairs; in Wallonia, the Francophone Community Parliament and government are competent for community affairs, while the Walloon Regional Parliament and government are responsible for regional affairs. Subsequent constitutional reform established a community Parliament and government for the German-speaking cantons in 1983, and a regional Parliament and government for the Brussels Capital Region in 1989. Of total public spending—interest payments not considered—more than 40% is authorized by the regions and communities. Provincial and Local Government In addition to three regions and three cultural communities, Belgium also is divided into 10 provinces and 589 municipalities. In Belgium, there are no major "national" parties operating on both sides of the linguistic border. Consequently, elections are a contest among Flemish parties in Dutch-speaking Flanders and Francophone parties in Wallonia. Only in officially bilingual Brussels can voters choose from either Flemish or Francophone parties. There are three main groups of parties in Belgium: the Christian Democratic parties, the Liberal parties, and the Socialist parties, along with Green and Communist parties and other, minor ones. The parties share generally similar political views but maintain separate organizations for each linguistic group. After World War II, the Catholic (subsequently Christian Democratic) Party severed its formal ties with the Church. It became a mass party of the center (more like a political party in the United States). In 1968, the Christian Democratic Party responded to linguistic tensions in the country by dividing into two independent parties: Christen-Democratisch en Vlaams (CD&V, English: Christian Democratic and Flemish) and Centre démocrate humaniste (cdH, English: Humanist Democratic Centre). The small, German-linguistic party in this grouping is Christlich-Soziale Partei (CSP, English: Christian Socialist Party), which works with cdH on the national level while in the European Parliament has successfully held the seat allocated to German-speaking Belgians since 1994. Despite the post-World War II dominance of the Christian Democrats, the Socialists headed several postwar governments. The Socialists also split along linguistic lines in 1978: Socialistische Partij Anders (SP.a, English: Socialist Party Differently) and Parti Socialiste (PS, English: Socialist Party). PS has strong showings in the industrial towns of Wallonia, while SP.a has less regional concentration. The small, German-linguistic party in this grouping is Sozialistische Partei (SP, English: Socialist Party). In modern times, the Liberal Parties in Belgium have chiefly appealed to business people, property owners, shopkeepers, and the self-employed. The parties maintain a more conservative free market oriented economic ideology on economic issues and a non-interventionist ideology in social issues, as reflected in their strong support for gay marriage, homosexual adoption, and euthanasia, similar to the Libertarian Party of the United States. The two current Liberal parties were formed in 1971, after the original all-Belgium Liberal Party split along linguistic lines: Vlaamse Liberalen en Democraten (VLD or Open VLD, English: Open Flemish Liberals and Democrats) and Mouvement Réformateur (MR, English: Reformist Movement), which is more of a federation than a party and includes the German-linguistic Partei für Freiheit und Fortschritt (PFF, English: Party for Freedom and Progress). The ecologist parties made their Parliamentary breakthrough in 1981. Following significant gains in the 1999 general elections, the two Green parties joined a federal coalition cabinet for the first time in their history in Prime Minister Verhofstadt's first six-party coalition government. The parties experienced significant losses in the May 2003 election, however; with the French party winning only four seats in the House and the Flemish one failing to win any seats. They were thus excluded from the new coalition formed by returning Liberal Prime Minister Verhofstadt in 2003. The two parties are the Flemish Groen (English: Green, previously AGALEV and later Groen!) and Francophone (Ecolo, officially a backronym for "Écologistes Confédérés pour l'organisation de luttes originales" which translates in English as "Confederated ecologists for the organisation of original struggles", but unofficially is simply short for "ecologist", the French term for environmentalist). There is no German-language counterpart to the Green parties. In Brussels the parties have adopted a joint list to maximize votes. Elsewhere they operate independently. The far-right Vlaams Belang (Flemish Interest) is the most militant Flemish regional party, with a separatist, anti-immigration, law and order platform. The Vlaams Belang was formerly called the Vlaams Bloc, until a 2004 high court ruling confirmed a lower court verdict that the Bloc was a "racist" party. Faced with further legal problems, the Bloc disbanded and resurrected itself as the Vlaams Belang, with the same party leaders but a less radical party policy. The Vlaams Belang was the second most popular party in the 2004 regional elections, with 24% of the vote. Polls in 2007 showed the Vlaams Belang as the second or third most popular political party in Flanders, after the Christian Democrats (at about 30%), about even with the Socialists (at about 20%), and ahead of the Liberals. The Confederation of Catholic Labor Unions (CSC/ACV). Organized in 1912, the CSC/ACV rejected the Marxist concept of "class struggle" and seeks to achieve a just social order based on Christian principles. The CSC/ACV is not formally linked to its party political counterparts, the Christian Democratic parties (CD&V and CDH) but exercises influence in their councils. The CSC/ACV is the leading union in all Flemish provinces and in Wallonia's Luxembourg province. It has almost equal strength with the socialist confederation in the Brussels area. Belgium, a highly developed market economy, belongs to the Organization for Economic Cooperation and Development (OECD), a group of leading industrialized democracies. With a geographic area about equal to that of Maryland, and a population of 10.4 million, Belgian per capita GDP ranks among the world's highest. In 2006, the per capita income (PPP) was $31,800. The federal government has managed to present balanced budgets in recent years, but public debt remains high, at 94% at the end of 2005. *GDP growth in 2006 was predicted to be 2.5%. GDP (PPP, 2006 est. ): $330.4 billion. Annual real growth rate (2006): 2.5%. Per capita income (PPP, 2006): $31,800. Agriculture: (1.4% of GDP) Products—livestock, including dairy cattle, grain, sugarbeets, nursery products, flax, tobacco, potatoes, and other fruits and vegetables. Industry: (24% of GDP) Types—machinery, iron, coal, textiles, chemicals, glass, pharmaceuticals, manufactured goods. Trade: Exports--$335.3 billion (2006 est. ): Iron and steel, coal, transportation equipment, tractors, diamonds, petroleum products. Export partners (2005 est. ): Germany 19.4%, France 17.3%, Netherlands 11.7%, U.K. 8.2%, U.S. 6.4%, Italy 5.3%. *Imports--$333.5 billion (2006 est. ): Fuels, chemical products, grains, foodstuffs. Import partners (2005 est. ): Netherlands 17.8%, Germany 17.2%, France 11.4%, U.K. 6.8%, Ireland 6.5%, U.S. 5.4%. Densely populated Belgium is located at the heart of one of the world's most highly industrialized regions. The first country to undergo an industrial revolution on the continent of Europe in the early 1800s, Belgium developed an excellent transportation infrastructure of ports, canals, railways, and highways to integrate its industry with that of its neighbors. One of the founding members of the European Community (EC), Belgium strongly supports deepening the powers of the present-day European Union to integrate European economies further. With exports equivalent to over two-thirds of GNP, Belgium depends heavily on world trade. Belgium's trade advantages are derived from its central geographic location and a highly skilled, multilingual, and productive work force. The Belgian industrial sector can be compared to a complex processing machine: It imports raw materials and semi-finished goods that are further processed and re-exported. Except for its coal, which is no longer economical to exploit, Belgium has virtually no natural resources. Nonetheless, most traditional industrial sectors are represented in the economy, including steel, textiles, refining, chemicals, food processing, pharmaceuticals, automobiles, electronics, and machinery fabrication. Despite the heavy industrial component, services account for 74.6% of GDP. Agriculture accounts for only 1.4% of the GDP. For 200 years through World War I, French-speaking Wallonia was a technically advanced, industrial region, while Dutch-speaking Flanders was predominantly agricultural. This disparity began to fade during the interwar period. As Belgium emerged from World War II with its industrial infrastructure relatively undamaged, the stage was set for a period of rapid development, particularly in Flanders. The postwar boom years contributed to the rapid expansion of light industry throughout most of Flanders, particularly along a corridor stretching between Brussels and Antwerp (now the second-largest port in Europe after Rotterdam), where a major concentration of petrochemical industries developed. The older, traditional industries of Wallonia, particularly steelmaking, began to lose their competitive edge during this period, but the general growth of world prosperity masked this deterioration until the 1973 and 1979 oil price shocks sent the economy into a period of prolonged recession. In the 1980s and 1990s, the economic center of the country continued to shift northward to Flanders. Foreign investment contributed significantly to Belgian economic growth in the 1960s. In particular, U.S. firms played a leading role in the expansion of light industrial and petrochemical industries in the 1960s and 1970s. The Belgian Government encourages new foreign investment as a means to promote employment. With regional devolution, Flanders, Brussels, and Wallonia now have substantial autonomy in courting potential foreign investors, as each deems appropriate. Foreign direct investment totaled more than $36.7 billion in 2005. U.S. and other foreign companies in Belgium account for approximately 11% of the total work force, with the U.S. share at about 6%. U.S. companies are heavily represented in the chemical sector, automotive assembly, and petroleum refining. A number of U.S. service industries followed in the wake of these investments—banks, law firms, public relations, accounting, and executive search firms. The resident American community in Belgium now exceeds 20,000. Attracted by the EU 1992 single-market program, many U.S. law firms and lawyers have settled in Brussels since 1989. On May 1, 1998, Belgium became a first-tier member of the European Monetary Union. Belgium switched from the Belgian franc (BF) to the Euro as its currency after January 1, 2002. About 75% of Belgium's trade is with fellow EU member states. Given this high percentage, Belgium seeks to diversify and expand trade opportunities with non-EC countries. Belgium ranks as the 11th-largest market for the export of U.S. goods and services. If goods in transit to other European countries are excluded, Belgium ranks as the 12th-largest market for U.S. goods. Bilaterally, there are few points of friction with the U.S. in the trade and economic area. The Belgian authorities are, as a rule, anti-protectionist and try to maintain a hospitable and open trade and investment climate. As a result, the U.S. Government focuses its market-opening efforts on the EU Commission and larger member states. Moreover, the Commission negotiates on trade issues for all member states, which, in turn lessens bilateral trade disputes with Belgium. The social security system, which expanded rapidly during the prosperous 1950s and 1960s, includes a medical system, unemployment insurance coverage, child allowances, invalid benefits, and other benefits and pensions. With the onset of a recession in the 1970s, this system became an increasing burden on the economy and accounted for much of the government budget deficits. The national unemployment figures mask considerable differences between Flanders and Wallonia. Unemployment in Wallonia is mainly structural, while in Flanders it is cyclical. Flanders' unemployment level equals only half that of Wallonia. The southern region continues a difficult transition out of sunset industries (mainly coal and steel), while sunrise industries (chemicals, high-tech, and services) dominate in Flanders. Belgium's unemployment rate was 8.5% in 2006. A total of 4.4 million people make up Belgium's labor force. The majority of these people (73%) work in the service sector. Belgian industry claims 25% of the labor force and agriculture only 2%. As in other industrialized nations, pension and other social entitlement programs have become a major concern as the "baby boom" generation approaches retirement. Although Belgium is a wealthy country, public expenditures far exceeded income for many years, and taxes were not diligently pursued. The Belgian Government reacted with poor macroeconomic policies to the 1973 and 1979 oil price hikes by hiring the redundant work force into the public sector and subsidizing industries like coal, steel, textiles, glass, and shipbuilding, which had lost their international competitive edge. As a result, cumulative government debt reached 121% of GDP by the end of the 1980s. However, thanks to Belgium's high personal savings rate, the Belgian Government financed the deficit from mainly domestic savings, minimizing the deleterious effects on the overall economy. The federal government ran a 7.1% budget deficit in 1992 at the time of the EU's Treaty of Maastricht, which established conditions for Economic and Monetary Union (EMU) that led to adoption of the common Euro currency on January 1, 2002. Among other criteria spelled out under the Maastricht treaty, the Belgian Government had to attain a budget deficit of no greater than 3% of GDP by the end of 1997; Belgium achieved this, with a total budget deficit in 2001 (just prior to implementation of the Euro currency) that amounted to 0.2% of GDP. The government has balanced the budget every year since. Belgium's accumulated public debt remains high, but the liberal-socialist coalition government has paid it down to 94% of 2005 GDP. ↑ The small German community, primarily located in the Constituency of Liege, also has its own set of minor parties; however, for national interests Liege is considered a Francophone region, and traditionally in national elections the German parties in Liege have run on a joint list with the respective Francophone party representing its political viewpoint. ↑ Though rare, joint lists between Flemish and Francophone parties are permitted, most recently in the 2014 election, the Flemish and Francophone Green Parties ran a joint list in Brussels. This page was last modified on 19 April 2019, at 16:08. This page has been accessed 28,379 times.